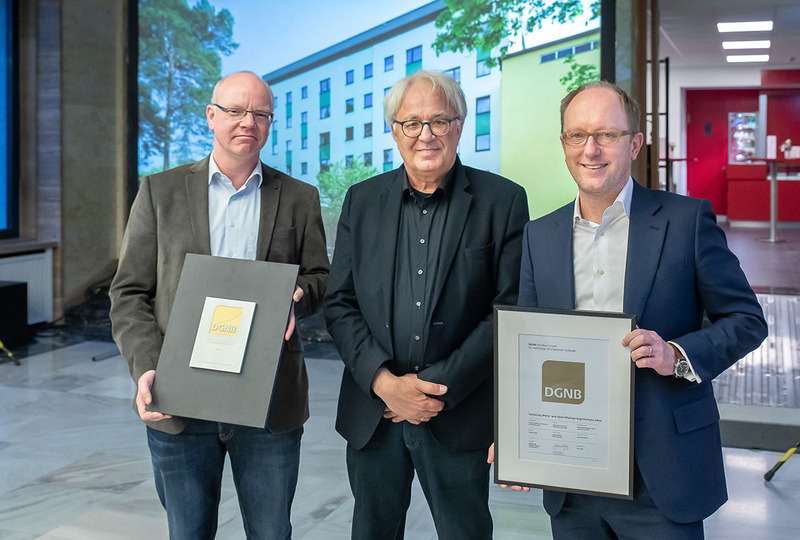 The president of the DGNB Professor Alexander Rudolphi presented the association’s gold certificate to the CEO of Deutsche Wohnen Michael Zahn at the residential property company’s headquarters in Berlin-Wilmersdorf. The residential and commercial property at Argentinische Allee 221 in the historic Woodland Estate (aka Uncle Tom’s Cabin) was built in 1970. 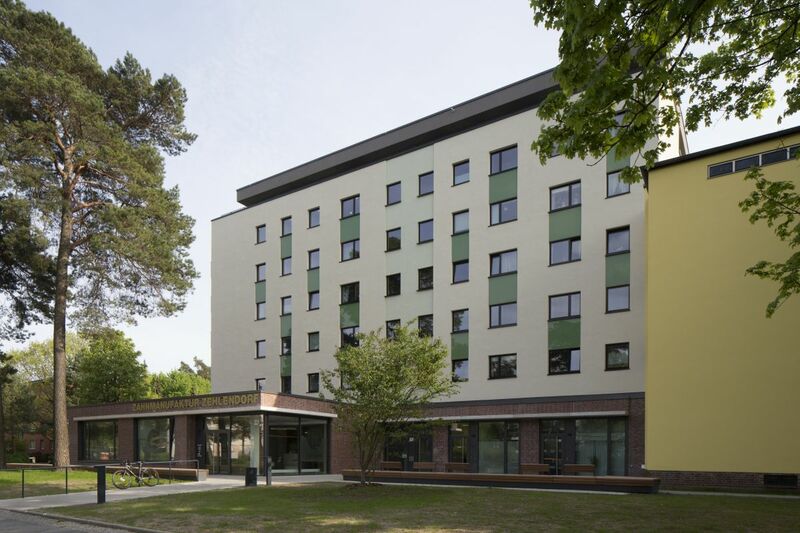 Its refurbishment involved modernising the building and improving its energy efficiency. As a stand-alone building with its own particular design, it had always looked a little out of place. So, the refurbishment was also taken as an opportunity to integrate it into the surrounding Woodland Estate, which has such an important architectural heritage. Deutsche Wohnen had the entire process from planning through to construction monitored within the scope of the DGNB’s sustainability certification in accordance with the requirements set out in the utilisation profile for new, mixed-use buildings. Indeed, a qualified sustainability consultant was involved in the entire planning process. As a result, it was possible to define the desired sustainability criteria right at the start of the planning phase. A total of more than 30 criteria in the areas of ecology, economics, technology, socio-structural and functional quality, and location and process quality were evaluated. “Process quality”, for example, is measured by the extent to which aspects of sustainability are taken into consideration even at an early stage when work is put out to tender. And in the area of ecology, checks are carried out to establish the type of materials being used and the extent to which resources are being dealt with sustainably. After all the criteria had been examined, the refurbishment of the residential and commercial building at Argentinische Allee 221 achieved “gold” status, the second highest rating. The Woodland Estate in Zehlendorf or Uncle Tom’s Cabin is one of the capital city’s most valuable residential quarters in terms of its architectural history. It was built in 1930/31 according to plans by Bruno Taut and is currently a candidate for UNESCO world heritage status. The five-storey residential and commercial building at Argentinische Allee 221 was only added much later in 1970. According to the standards of the day, it was intended to constitute the final element of this architectural ensemble, which is popularly known as the “whip crack”. In the end, however, the building was not successfully integrated into the highly characteristic appearance of the estate. The refurbishment work has corrected this problem, and the residential and commercial building is now positioned as a noticeable overture to the estate itself. Of key importance were the facades, whose design is now in harmony with that of the existing estate. In particular, the use of bold colours and different materials to divide the facade into sections, which was so typical of Taut, was replicated here. The brickwork and plaster design, and the different material used for the base in order to create a contrast, create visible references to the neighbouring buildings. Moreover, the use of colours in the interior of the building echoes the design of the Woodland Estate. The energy-efficient refurbishment of the building was achieved by insulating the facades, the cellar ceilings, the windows and the roof. Following this work, the building has reduced its energy consumption by 80%. In order to provide accommodation that meets today’s standards and to enable residents to stay in their homes for as long as possible, the bathrooms and toilets were modernised, and corridors, doors and bathrooms were made wider so that they can be used by the elderly and by people with physical impairments as well. The elevator was extended upwards to enable residents to access the top floor of the building without the need to use stairs. Last but not least, investments were made in noise insulation. The refurbishment of the building began in 2016, and the overall investment sum was EUR 4.2 million. The building has a total of 25 flats. On the ground and first floors, there is a dental surgery, a physiotherapy and a speech therapy practice, and a firm of architects. Melder & Binkert, a firm of architects and urban planners, was commissioned with the refurbishment work. The firm is a member of the Federation of German Architects.